Welcome. I'm Amrith Ramkumar, walking you through this morning's premarket headlines. Salesforce.com is surging after earnings and stock futures are rising ahead of a second reading of third-quarter U.S. GDP. Before we see if major indexes can advance for a third consecutive session, oil reporter Stephanie Yang explains why bullish investors are hesitant to buy crude on the cheap even with positive catalysts potentially on the horizon. Global stocks climbed Wednesday, with investors cautiously optimistic for a breakthrough in U.S.-China trade relations at a crucial summit later in the week. Analysts are calling bargain prices after oil's recent selloff. But few are stepping in to buy just yet. Bullish speculators have been hammered by a dramatic fall in crude prices, driven by an unexpected influx of supply and signs of weakening economic growth. But even with potentially bullish developments on the horizon, some investors have decided it isn’t worth the risk. “When you get to the last four weeks of the year, there are so many managers sitting on their hands," said Tariq Zahir, managing member of Tyche Capital Advisors. Part of the uncertainty comes from a trading environment that has been difficult for fundamental investors to parse, according to Goldman Sachs analysts. The bank wrote this week that the drop in crude is unsustainable, and should eventually draw investors back in. Some analysts say the recent fears are overblown and the selloff was exacerbated by financial players getting out of an overcrowded trade. Net long positions in U.S. oil futures fell to the lowest level in over a year last week, according to data from the Commodity Futures Trading Commission. However, with bearish sentiment running the market, most are wary of buying oil without a clear catalyst for higher prices. "There's nothing bright out here. 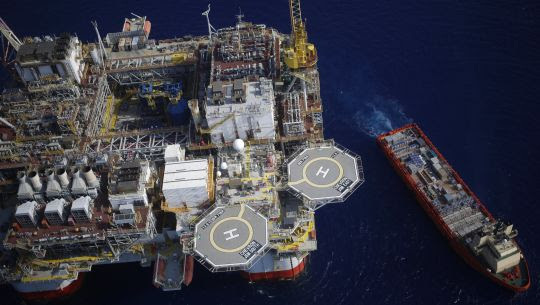 Nobody's really excited yet, nobody's finding a bull," said Donald Morton, senior vice president at Herbert J. Sims & Co., who oversees an energy trading desk. "The market continues to feed on itself. Another round of negative thought process and you just see more selling pressure." One such trigger could be the G-20 summit in Argentina this weekend, with leaders from Saudi Arabia, Russia and the U.S. in attendance and the recent oil rout in focus. Trade talks between the U.S. and China could also have implications for economic growth and oil demand. Another will be the meeting between the Organization of the Petroleum Exporting Countries and its allies, set to begin Dec. 6 in Vienna. Saudi Arabia is considering a plan to keep output targets set in 2016, but rein in overproduction that amounts to about 1 million barrels a day. However, analysts doubt Russia’s willingness to participate in another cut, as the country’s output has climbed to record highs. U.S. shale production has also surged beyond expectations, putting even more pressure on the market. Are you still bullish on oil? Let the author know your thoughts at stephanie.yang@wsj.com. Emailed comments may be edited before publication in future newsletters, and please make sure to include your name and location. The ratio of bearish options to bullish options on the S&P 500 is currently near its lowest level since the financial crisis, according to JPMorgan Chase. The put-call ratio tends to fall during market corrections as investors sell stocks and don’t need to use options to hedge as much, JPMorgan derivatives strategist Bram Kaplan said in a recent note to clients. With its 1.2% dip Tuesday, the S&P 500 materials sector is now down 12.2% for the year, on track for its largest annual decline since 2008. Shares of Papa John's fell 10% Tuesday, their largest one-day drop since November 2015. The slide came after the Journal reported that Trian Fund Management, a major potential bidder for the pizza chain, has taken itself out of the running. U.S. trade in goods for October is out at 8:30 a.m. ET. U.S. gross domestic product for the third quarter is also scheduled for 8:30 a.m. The revised figures are expected to be unchanged from the advance reading of 3.5% growth. U.S. new-home sales for October, out at 10 a.m., are expected to rise 4% to an annual pace of 575,000. The Richmond Fed manufacturing survey for November is slated for 10 a.m. Crude-oil inventories will be released at 10:30 a.m. Stockpiles are expected to have climbed 500,000 barrels during the week ended Nov. 23, according to the average target of nine analysts and traders surveyed by the Journal. Steadily rising inventories have contributed to the recent plunge in oil prices. Fed Chairman Jerome Powell speaks at the Economic Club of New York at 12 p.m.
Why oil prices took such a tumble—and what comes next. 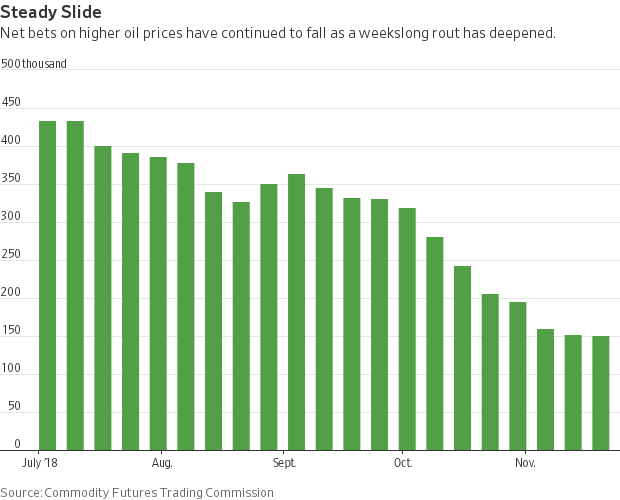 It was only at the start of October that analysts were wondering if oil would soon cost $100 a barrel. Then a trap door opened and oil prices have been in a rapid descent since, losing nearly a third of their value in about eight weeks. What sparked the reversal? Multibillion-dollar hedge fund Ascend Capital will return client money. The fund is effectively shutting down, with plans to turn itself into a family office, according to a client letter sent Tuesday. Deutsche Bank is weighing a new shakeup. The German lender is considering a high-level shuffling that could lead to the departures of its chief regulatory officer and a top executive in the Americas as the German bank continues to deal with global compliance problems. Microsoft is closing in on Apple as the world’s most valuable company. Microsoft briefly eclipsed longtime rival Apple as the world’s most valuable company, before a late rally by the iPhone maker kept it in the top spot. Investors are preparing for another Brexit surprise. Markets got the original Brexit referendum spectacularly wrong. Some expect more surprises when the U.K. parliament votes on a formal EU exit deal on Dec 11. Amazon.com: The e-commerce giant is starting to sell software to mine patient medical records for information that doctors and hospitals could use to improve treatment and cut costs, the Journal reported late in Tuesday’s session. Salesforce.com: The business-software company reported increasing sales and grew its backlog of business during its latest quarter, though higher operating expenses weighed on its bottom line. Nutanix: The San Jose cloud software maker posted a 14% increase in quarterly revenue, a larger climb than analysts projected.